These treats may look like muffins, but as you might have guessed – they’re not. We call these Steamed Cakes “Mushi-pan” (蒸しパン) in Japanese. The biggest difference between these cakes and muffins is that these delicious little treats are steamed instead of baked. What is Steamed Cake (Mushi-pan)? 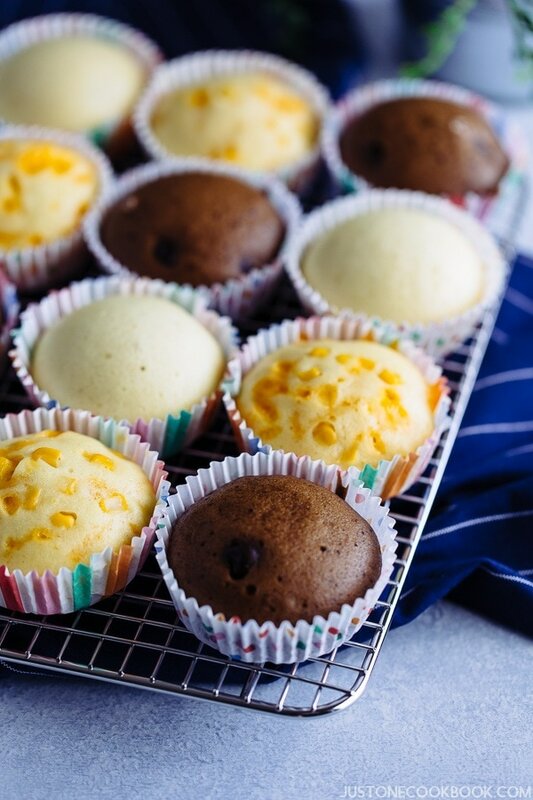 The Japanese steamed cakes are made with very simple ingredients: flour (all-purpose flour or cake flour), baking powder, eggs, milk, sugar, and neutral flavored oil (such as vegetable oil). 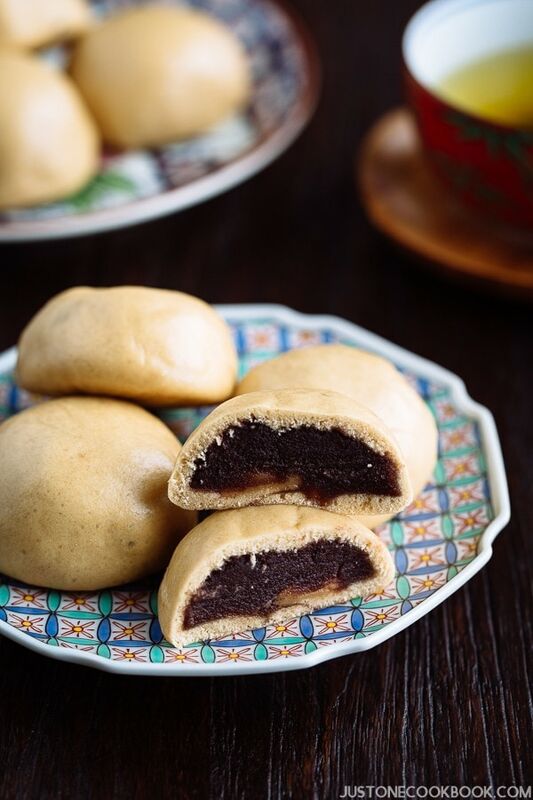 While Chinese steamed bun called Mantou (饅頭) uses yeast as a leavening agent, Japanese steamed cakes use baking powder. After WWII, when a massive amount of wheat flour was imported from the U.S., and the Japanese started to eat more bread – “pan” (パン) in Japanese. Around the same time, steamed cakes started to appear in Japanese kitchens. As sugar was expensive back then, the Japanese included small chunks of Japanese sweet potatoes (Satsumaimo) to sweeten the steamed cakes. 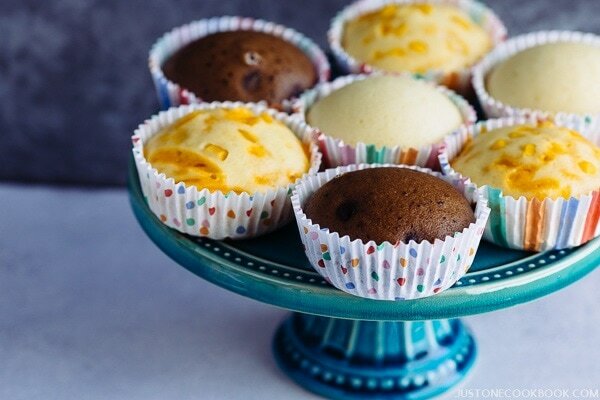 These Satsumaimo Steamed Cakes are still the most popular flavor for steamed cakes today. In the late 1980s, convenience stores in Japan started to sell Cheese Mushi-pan (チーズ蒸しパン) and Chocolate Mushi-pan (チョコ蒸しパン) that became really popular. I remember being addicted to Cheese Mushi-pan. The savory cheesy flavor was really to hard to resist. My homemade steamed cakes are not the same as those Cheese Mushi-pans. However, homemade steamed cakes are equally delicious and you can play around with various flavors. Unlike store bought cakes, there is no preservatives and additives. This recipe is so quick and easy to make! Even my children can make them as long as I help with the steaming. It only takes 20 minutes from start to finish! Since they’re quick to make, you can make them fresh whenever you want to eat them. The best part of steamed cakes is that they can be easily changed to either savory or sweet flavor. My Basic Steamed Cake recipe below is the standard recipe where you can adapt to sweet or savory versions as you please. For sweet steamed cakes, you can add vanilla extract. I didn’t add it so the recipe can be changed to a savory one. I recommend keeping the sugar for the savory version as a slight sweetness helps to enhance flavor. You can store in the freezer for later and re-steam it when you want to eat for a quick snack. The steamed cakes will be soft and spongy again! 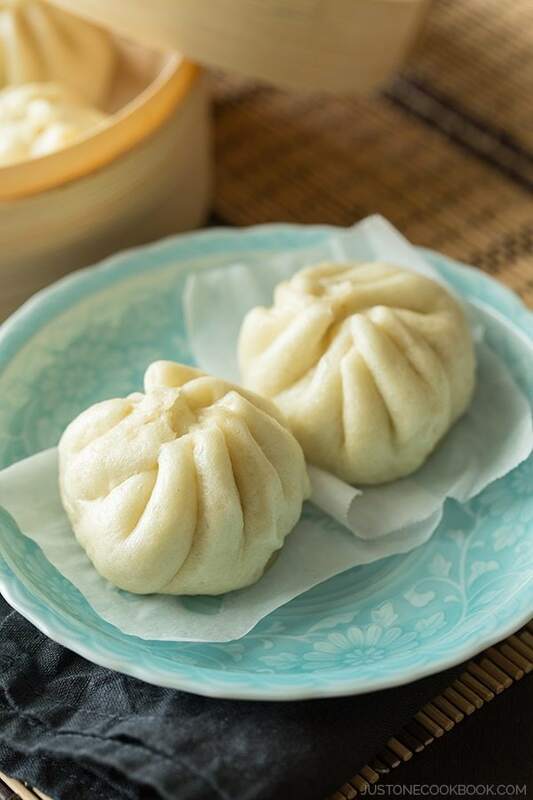 If you give my Mushi-Pan recipe a try, let me know. I’d love to hear about your variations and results in the comments! Do you like matcha green tea flavor? Check out my Green Tea Steamed Cake too! Editor’s Note: This post was originally published on May 4, 2011. 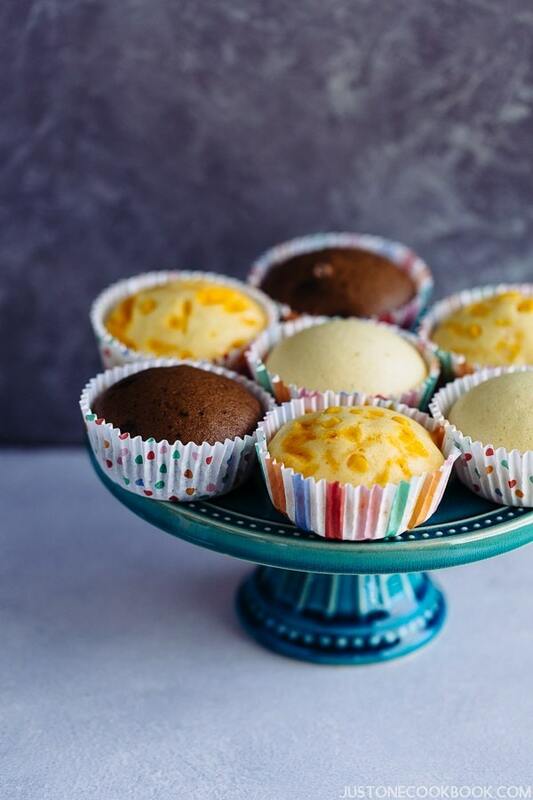 Oh wow, these look lovely – I have never steamed cupcakes before! I love that this mixture only makes 4. My recipes are all for 12 which which makes it nice to share with friends. Your little ones are so cute. What a cute and fun recipe! I love it! Hi Kimberley! Cute + fun + QUICK! Wowow~~~ Nami yours look great!!!! Upon venting thru your recipe I knew “OIL” is missing from the recipe that i have hehe…but no worries they turn out great too just that it is not as soft as what I want it to be like those chiffon cake texture. But no matter wat, thanks for sharing this great post of with me and the rest who is intereted too 🙂 I will try your chocolate chips recipe this weekend or mb tmr as I am sure my boy will love it :p droolllll now. Thanks pal. Steamed cake sound healthy and good. and your two assistants in kitchen are adorable..glad you share their photo with us. I have never heard of a steamed cake before..but the ones with cheese and corn are my kind of cake! As for your question about baking, I usually bake when I have people coming over and if they like it I usually give them what is left (take away) so I hardly get a piece. Another plan is to give baked goodies as gifts..people would really appreciate it..
Hi Sawsan! Thank you. 🙂 They look a little sloppy right after nap. 😀 I thought this is great for kids… not so much sugar and no butter and all. Very healthy treat. Thanks for letting me know the tip! You are already a good baker that everyone must be so happy to get as a gift/leftover! I guess I need to find someone who eats anything when I start to bake. I’m too shamed to give away my trials. LOL! Hi C & MSP! Thank you. 🙂 Oh maybe they will start baking for ME! I have never heard of steamed cakes before but they certainly look delicious! Nice job! Your little ones are so cute 🙂 I love the process of baking and the happiness it brings to everyone who bites in to every little creation. I usually end up giving half of it to my parents or in-laws because we aren’t big into sweets around here. Unless it’s those Mango Blueberry Muffins, then it’s hands off!!! Hi Dee! Thank you! Yeah the process of baking is definitely more fun for the kids than the process of cooking dinner. You are not into sweets although you make such delicious desserts?! Oh ya your Mango Blueberry Muffins recipe is in my top of To Bake List! Thank you Sandra! I know…I wish we are “next-door” neighbors so I can try your food! LOL. First of all Congratulations to your little helpers … they are ever so cute and I am sure were a great help in all this. Next I have just learnt something new, I never knew that you could actually make a steamed cake … and without any butter too. I am going to give these a try. Hi Chris! Thank you for your kind words. 🙂 True, you reminded me that we don’t need butter for this cake! It’s very healthy cake and I feel great about giving these to my kids (and myself who need to watch out weight. 😉 Hehee ). Hi Tiffany! Hehehee… Not yet… SOON! Maybe this year….but no promise. LOL. Baking is one of my passions! I do it for the people I love. My favorite part? The dough!! Hi Peggy! Hahaha… don’t get too excited… I have to lose 10 lbs and baking desserts doesn’t encourage me to lose weight… LOL. I have not eaten steamed cakes in a while. The corn and cheese ones sound really interesting, almost like corn bread. Well alrighty then, Nami bakes!!! I’m proud of you girl and you have two of the cutest assistants. One sweet recipe down and lots more to come. Hi Sandra! Heeeeee >_< Please don't say that yet. LOL. Well, for this particular recipe, I "steamed" okay? Let us hope sweet recipes will come…sooon….maybe…. LOL. I feel a bit silly, but I didn’t know you could make pastry on a pan filled with water! I love the idea. (This is probably because my interest in the Japanese cuisine hasn’t extended yet to the sweet dishes 🙂 They look beautiful and delicious (your little helpers too 🙂 ! I would never guess you don’t have a habit of making sweets! Hi Sissi! LOL… You are very funny (about not fitting into the door)! Thanks for sharing all the good tricks! So you do need some kind of tricks and you developed them nicely that works for you and your husband! It was a great tip actually. Also, you can use a regular steamer (like Chinese steamer) but this method works just fine too. Thanks for visiting my site! I totally understand about being unable to stop once you start – what I usually do is bake small batches only. I sometimes use 1/4 of an egg! And I also freeze cookie dough. It freezes really well but cookie dough is delicious, even if frozen. So I prefer making small batches! Thank you for visiting my site Torview! Hi Jess! I think if my mom was baking when I was growing up, I probably have tasted more homemade sweets and seen how she would make it. Without those experiences I just enjoy whatever we bought from stores and that was okay to me. Now I have kids, and I sort of wish that they grow up differently. But I must need to change so that kids will enjoy baking with me. By the way, I’m glad you like my method! B – “STEAMED” cake? I must admit I raised my eyebrows, but after reading about it and reading through the directions, I think I’m going to give it a try. This looks like a fantastic cake! C – I am really happy to have my American size oven, but I wonder if there’s a significant correlation between American size people and their American size oven verses Japanese size people and Japanese size ovens? Hum…. A pleasure to read as always. Thank you! 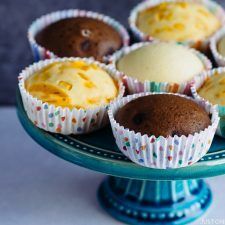 Nami-these adorable little cakes look so much fun and easy way to make them. I never steamed cakes before…all new to me. No wonder you didn’t really need an oven in Japan, when you could make goodies like these on top of the stove. Hi Elizabeth! Thank you for your kind words! 🙂 We use a lot of cooking over stove, but I need to learn more oven bake recipe so I can do multitasking while I’m cooking dinner or sweets. Oh, those look so tender and yummy. I love it when people step out of their comfort zone! Bravo. Your little helpers are darling too! Hi Mika-san! I know. I really wanted to eat red bean ones, but I wasn’t sure of opening the whole can of sweetened red bean…but will try with red bean for sure! Maybe it’s a great discipline for me to work for a bakery/pastry shop! Hi Jen! Thank you! 🙂 I think it’s more popular in Asia than here in the US. After I started to follow a couple of Malaysian bloggers, I learned that you can find a lot of Japanese stuff in Malaysia (maybe depends on where in Malaysia). It’s nice! ooo thanks for sharing these! Those little treats look very tempting indeed!! I came here via ellana’s mention of you. will be back! These are gorgeous, you’ll a natural baker 😉 Oh and believe me, it’s always a problem after I’ve baked – what do I do with it! Usually I get my friends to come round and we eat it, so it’s all gone before I’m left alone with too much cake, which would be dangerous! This is very new to me and I love learning new things, especially when they look this good! Hi CG! Thank you. 🙂 Haha me too. I can bake cho chip cookies. 😀 You don’t like following recipes? I am so worried not following enough. I’m like making sure one by one if I have right amount of ingredients when I bake… I just don’t know how it will turn out if I make a slightest mistake… Cooking is fixable (in some way) but definitely not baking. SO HARD! Nami, I’ve had steamed cakes before but never steamed cupcakes… Yours looks really good! I’m especially drawn to the ones with corn and cheese, and of course, to this two little ones wearing red! Your kids are adorable :-). Kisses to your very cute colour coordinated little helpers <3. We eat steamed cakes in the Philippines, too. Originally made from rice flour but the modern ones are made with flour. Cheese and corn! Love that! Hi nami! this cake is very Cute + fun + QUICK + New for me:))))). lovely i’ll try it. Heehee.. you are true Japanese! 😉 You made with Matcha and now with Anko! Yes, I was actually thinking of making with Anko, but my kids don’t eat beans and the can is huge… Add Anko in the batter, and decorate the top with some Anko too! It’ll taste good. I loooove anko…. I never thought that steam could bake cakes… Very interesting and easy to make. I will bookmark this recipe for a future reference. Thank you so much for sharing! Hi Eftychia! Unlike your decorative cake, this is very quick and easy cake. 🙂 Thank you for stopping by! Oh, my gosh, your sweet helpers have won my heart! Just adorable! Thank you Elyse! 🙂 And thank you so much for passing me the awards! These cakes look fabulous! Great idea. Your kids are so cute too!! Ive never made or had steamed cake. These look so great!! A must try! Hi Beth! It’s very common in Asia but not here or other places, I guess. It’s ready in 20 minutes. Isn’t that great? I used to have something similar when I was in Shin-Yokohoma for a while.. But they were stuffed with red beans… !! It was a favorite… !! I have never tasted a tasty and nutritional steam cake like that before and after….!!! Hi Emreen! Shin-Yokohama! That’s my neighborhood! Well, 10 mins away by subway from there. =) I love red bean and all Japanese do…LOL. This one is easy to make, and I’ve been wanting to make red bean one, but little too busy lately… =P Thank you for stopping by my blog! Hi Nami. I’m sorry I missed this post. I love how the cake is steamed in the glass ramekins. that’s a wonderful idea! Hi Amy! I’m glad you like this. I don’t bake cake, but I can steam mini cakes in a frying pan. 😉 Very fast, easy, and yummy! it’s soooo moist and soft..thanks! Hi Steffie! Yay! I’m so happy you and your friends liked it. 🙂 Thank you for letting me know! 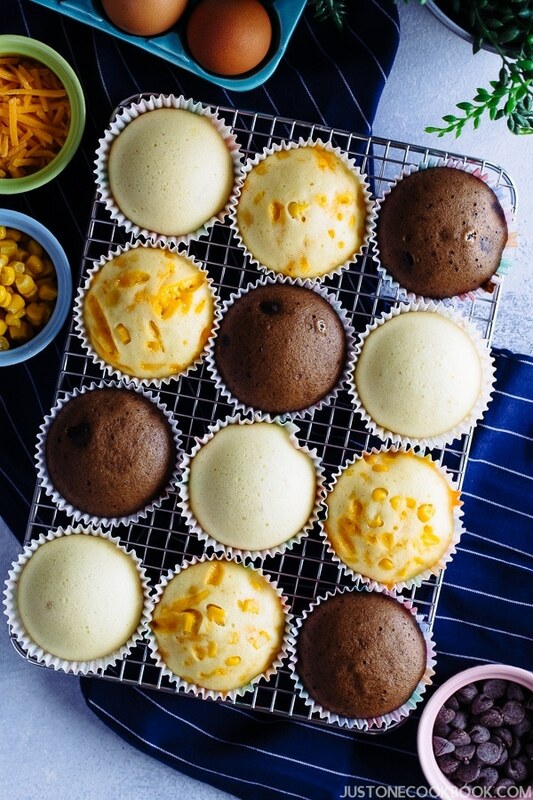 We also have steamed cupcakes in the Philippines using rice flour. I tried it once but the recipe it didn’t come out as I expected. Maybe I can try yours. It looks delicious! I made this today and LOVED the texture! Like soft little pillows! I’m used to little sweeter things tho 🙁 so was wondering if it would be ok to increase the sugar to say 4 tbsp? Would that affect the texture you think? Please give it a try and let me know. I personally think you can adjust sugar amount to your liking. 2 Tbsp was perfect for us. 🙂 Thanks for trying this recipe Rose! Thanks again for such a super recipe! Will be trying more variations soon! Oh, I’m so glad I found this! I was looking up bolu kukus mekar recipes but couldn’t find (a non-chocolate) one I wanted to try in English and came across this. I love that this yields 4 only. Makes it so easy to try; earlier this week I made a batch of cookies that yielded about 4 dozen and I made my boyfriend take some to work because there were so many! Hi Mayene! I’m glad you found my blog. 🙂 It’s nice to meet you. I hope you will enjoy this recipe. This is a very convenient recipe as you can add any ingredients (I’ve tried sweet potatoes, Nutella, etc) and cook very fast! Enjoy cooking! i don have glass ramkins. i have the normal white baking dish type of ramkins. are they ok to use for this steamed cakes? 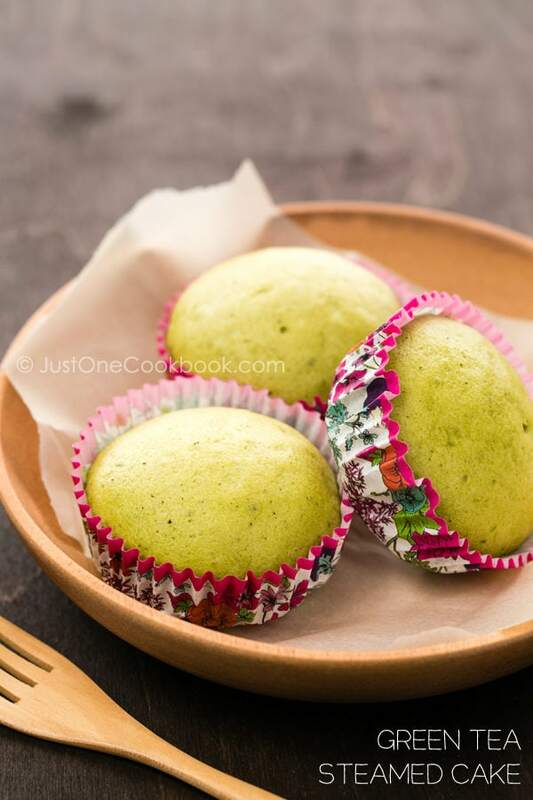 Thanks for sharing this Japanese Steamed Cake recipe. It looks super easy to make. I’m going to have to try it. =) BTW, your two little assistants are super cute. I made these and they turned out to be quite stiff and hard. D: Not at all fluffy.. What happened?? Hi Pauline! Hmmm not sure why. It’s steamed so it gets fluffy and spongy but not hard at all. Maybe overcooked? I make these often and I don’t have any problem. As I mentioned in my FAQs’ page, it’s really hard for me to figure out what went wrong because I wasn’t there when you were coking. But from your description, it sounds like overcooked. i came accross ur blog from the cooking hut. love this all japaness food recipe as me n my husband is a big fan of japanese food. thanks for the beautifull blog. i have question regarding all purpose flour. is the packaging really says all purpose flour or is that means plain flour? im from sydney, so im not sure if here have it. According to Google result, it seems like you call it “plain flour” for all-purpose flour. I hope you enjoy the recipe! Hey 😀 I’m 15 years old and i burnt down my oven lol and I LOVVVE baking. I was so sad when it did because I was going to bake cupcakes for my friend next week at school. Then I went on google and found these! Im wondering though, does it taste like a normal cupcake, or is it different texture?? In Philippines where i used to live, we had something like these but they weren’t cupcakes. It was called puto lol. But thanks for sharing! Hi Miki! It’s a little bit different texture from cupcakes. If Puto is steamed then probably similar. More airy I think. I hope you give it a try! I just made these and I am amazed at how simple and quick they are to make. I love steam cakes because they’re so light! Mine came out drier than I expected and I was wondering if it’s meant to be that way or something went wrong? I’m chinese so maybe our version of steam cakes are slightly different? :s Thanks for sharing though, I’ll definitely make more of ’em in the future! Hi Clarissa! Thank you for trying this recipe. It shouldn’t be too dry. I wonder if they were overcooked. I have tried Chinese version once or so, but I don’t quite remember how it was compared to Japanese kind… sorry I am not helping you much. These were pretty moist inside. I hope you can adapt and enjoy this recipe! However, I always thought that japanese cake was fluffier and lighter and mine turned out more like a muffin texture. Was it because there were too much liquid? Did you whisk all your mixture using a manual whisk and what do you mean when you said that whisking the flour and baking powder in Step 4 is a shortcut for sifting? i just tried this and love it! I’m already plotting how to adapt this for my daughter’s lunchboxes. Do you think I could make a savory version of this with whole wheat flour, some kind of green veggies puree and cutting out the sugar? Hi Situ! I’m glad to hear you liked this recipe! I have not tried with wheat flour but I’m sure you can adapt. Savory steam cake sounds good. It’s very versatile. I like adding chopped veggies (sweet potatoes and pumpkins) in it. Hi, Nami! I want to make more than four steam cakes, is it safe to double or triple the recipe? 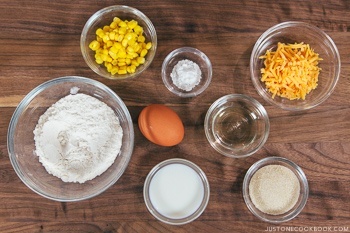 I’m dying to make the cheese and corn combi! Hi Gracey! Yes, you can double/triple the recipe. 🙂 Hope you will enjoy them! Hello Gracey! Yes! So happy it went successfully! My kids love these too! I’m really glad to hear you enjoyed them. 🙂 Thank you for letting me know! Hi mamahachi-san! Arigato for your feedback! Great to hear that you didn’t need liners and still turned out great. I’m happy to hear you enjoyed them. 🙂 Arigato~~! hello Ms. Nami. I saw your cakes, and i would love to try them all. I tried to be a “baker” as a hobby but financial difficulties came so now i would like to try baking as a source of an extra income. if you could help me, i need a recipe for a japanese cake. A very simple japanese cake recipe. i hope you will find some time for my request. Hi Innz! I bake occasionally and am still learning, so as you see in my Dessert page, you won’t see too many cakes. Please take a look at the page. What is Japanese cake you are referring too? I only have Japanese Cheesecake at this point (although we don’t call it so in Japan…). Do we really need to put the cup cake into the boiling water? Can i just steam like normal how we steam fish, on top of the water instead on into the water? hai,just tried the steam cup cake..was good with hot tea..! !my hubby like it..thanks for all of ur idea..i really like the easy way you present you receipes..gonna try one by one..good luck,Arigato..!! Hi J’marinde! I think you click one of the link exchange program photos at the very end of my post… These links help exchanging readers. I’m sorry for the bad experience but at the same time new readers come from some other sites through this program. I’m truly sorry about that. Thanks so much for the recipe.^^ Your kids are so cute!>.^< the deserts there look delicious! Thanks for the recipe! I just made it for my kids because my youngest wanted to eat cupcakes! I love it, it’s so easy and quick! I’ve made Chinese steamed cake before, but it’s more steps and required to take out my electric hand mixer, so I got lazy making it! lol…I want to try to make green tea steamed cake, do you have that recipe? Hi Maggie! So happy to hear you liked this recipe. We do too! I’ll consider making green tea steamed cake and share next year. Thanks for your suggestion! Hi Noora! I love all of the version you have made! And cook in rice cooker sounds excellent! I think my rice cooker comes with steamer option too but I haven’t paid attention to that option yet. Thanks for the idea! I’m really happy that you liked the recipe and thank you for your feedback! Hi Nami! I featured these cakes on my site today! They are delicious! Could I do these in my rice cooker steamer basket using silicone muffin cups? But I have few things to ask. and only use the egg white? Hi Cathy! I’ve seen some steamed cake recipes with egg white only so it should work fine! And yes, you can use self raising flour. 🙂 Hope you enjoy! Just one thing, how can I stop any water going in the ramekins? My cupcakes got wet on the bottom & when I take then out, I see about 1cm of water inside. Hi Michi! Yay! So happy to hear your steamed cake turned out well. 😀 I personally don’t like very sweet cake/cupcakes, so I understand! It can be a nice side dish to main meal too (without much sugar). Water goes in? I think you probably put a little too much water in the pan. Depending on the shape of pan, ramekins, water amount should be adjusted. If you are done cooking, and there are so much water in the pan, you don’t need to put that much water in the beginning. It’s just for steaming, so next time cut down on water. 🙂 Hope that helps! Thank you so much for this recipe. It turned out beautifully and is so fast and easy to prepare. I used to buy this from a local Japanese bakery. But I have moved and it is too far away to go there. So am overjoyed to find this recipe. Thanks! hi, thanks for the recipe for steamed cakes. im not much of a baker, and iv got a “snacks around the world” cooking compertision coming up in a few days, and since i love japanese dishes i thought this would be perfect. thank you for the recipe, i found it realy easy to follow and hopefully it turns out great. i will try to test make it soon, incase it doesnt work out. but wish me luck all the same. all the best, and thanks again for the recipe. If I were to add mashed purple sweet potatoes in the center directly before steaming, would I have to steam for a longer period of time? Hi Constance! Since you already cooked and mashed the sweet potatoes, you don’t have to cook it through. I’d say you probably don’t need to cook that long. Check if it’s done with a skewer closer to center (but not the sweet potato area) to see how long you need to get the steamed cake cooked. Sounds delicious!! Hi if i put this in a microwavable pan instead of four separate cupcake liner, is it fine? is it the same cooking time? and in some steamed cake that i saw online, some are covered w/ aluminum foil, why is your not, what’s the difference? i never baked or steamed anything but i wanted to try. ive been reading steamed cake recipes for days now but i like your website because even if it doesn’t have video, it has a step by step picture. thanks. Hi Sabel! To be honest with you, I haven’t tried other methods besides this, and I am not 100% sure if a microwaveable pan would work. I’m not sure the heat resistance to cook in the frying pan, etc. This steamed cake is my older post, and my newer steamed cake recipe has better step by step pictures, so you might want to see. I cover the lid on top to steam and the lid is wrapped with a towel so the condensation won’t drop to the steamed cakes. I tried making the steam cake with cake flour instead of all purpose flour. However it failed. Is it because I substituted all purpose flour with cake flour that’s why it failed??? Please advise me!! Thank you!!! The steam cake puffed up when it was steaming in the pot. However, once I remove the cake from the pot, it starts shrinking. And the texture of the cake s hard and chewy. I tried adding more baking powder, but to no avail. Hi Devie! Oh! Haha, massive mochi like? You can use a heat resistant container (like oven safe dish?) if you don’t have ramekins. 😀 Thank you so much for trying the recipe! Nami, I am so happy I found your site. I made the green tea steamed cakes 3 times already(the recipe is beyond cute-4 little ones) and I just made the cocoa ones this morning and used yogurt instead of milk. Easy and so delicious. I got raves already from my friends. I did for some reason have to steam them longer than 8 minutes. Also, my cakes don’t get hard. They stay fluffy for some reason, which makes me quite happy. Only, I can’t seem to find these recipes when I look in your desserts tab. I have to punch them up on an internet search. 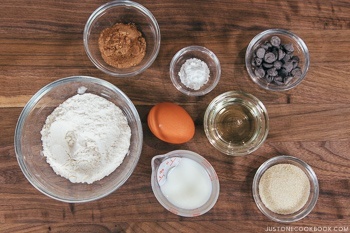 Where are they listed in your recipe index? Thanks again for posting them. I’ve made the mushi-pan 7 times now(green tea and chocolate). I noticed the last two times, I had big air pockets. Am I mixing the batter too much or too little? I also switched from King Arthur’s flour to Trader Joes. Would that make a difference? Or is it the steam heat? My sister said mushi-pan should have a very fine texture. Please let me know. Thanks. Hi Nami, after I tried your green tea cake I tried your chocolate cake too. This time I put ganache in the middle. I noticed though that both my cakes were a little rubbery in texture. Is it supposed to be like this? How can I prevent it? Thanks for the wonderfully easy recipe. It was my first time trying out a home made cake and it came out beautifully! My almost two year old loved it! I was wondering if you have any tips for adding banana to the basic cake? I tried adding a small banana to my second batch but it turned out very dense. Hi Selene! I’m glad to hear it came out well! Thank you so much for your feedback! 🙂 Make sure you smash them first before adding, and if it’s dense, try adding a little bit of milk. Hope this works! hi nami! thanks much for replying. yes, will try that. i have a small steamer. his birthday will be on september so i’ll have more than a month to practice hehehe. i hope i’ll get it right. thanks again! Happy early birthday to your son! 🙂 Hope he’ll like the steamed cake! Hi Nami! I’m a big fan of your blog, and my first recipe on the blog I just started is for strawberry mushi-pan! I love the method you used to steam your cupcakes, so I linked your recipe in my recipe notes as an option for those who don’t own steamers. These look delicious; I think I might try your savory corn mushi-pan sometime soon! Konnichiwa, namiko san. I wanna ask if i need to make chocolate mushi pan for about 20 pcs or more. What should I do with the measurement? Zehi oshiete kudasai, onegaishimasu. So, i gotta use 5 eggs overall? I got big steamer, that will help me a lot. I’m sorry for asking it here, for the matcha mushipan, i wonder if i can use the green tea teabags instead? here is really hard to find matcha powder. 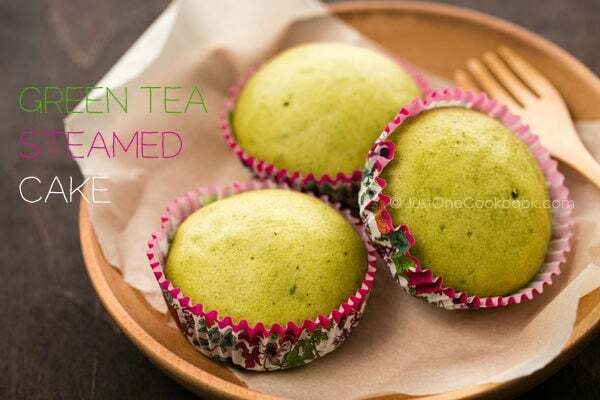 I luv matcha but can find a really nice matcha here except the teabags (leaves type) And, for this recipe, Nami san use AP flour and in Matcha mushipan you use Cake Flour, is it the same things? sorry, since I’m an amateur baker. I wish to try these recipes. I got a lot AP flour so wonder if i can use it as well for other mushi pan. (mostly mushipan recipe i found is using Cake flour). Arigatou Gozaimasu. Hi Cerena! Yes, you have to use 5 eggs for making 20 steamed cakes. Cake flour makes the steamed cake lighter, although all purpose works okay too. Hi Nami, just wondering can I use normal muffin tin to steam? Or can I just put it in the ramekin without the cupcake liners? Thanks in advance! This recipe looks so attractive I can’t wait to try! I’m so excited! I’ve tried the chocolate steamed cake and the result turned out amazing! Just like the Chinese steamed cake that we used to eat when i was young and that brought back memories! I bought cupcake liners and put them on the muffin tin and steam it. May I just say that I’m soooo glad that I found your website!!! All your recipes looks soooo amazing and I’m gonna try them out one by one! These are delicious! However they’re very noisy to make, as the boiling water makes the ramekins hop up and down to create a loud clunking noise for eight minutes. Is there a way to make it quieter? I tried the chocolate ones, but without chocolate chips. They’re amazing, but a little not sweet enough my taste since no chocolate chips. I will try with one more tbsp of sugar to compensate that but I will make more that’s for sure! Thanks for the great recipe! Steamed cake looks easy..I have give it a try. I m first time tho. Would like to know why the cake surface didn’t turn out as smooth as ur picture. And my Choco chip sink to the bottom in the cake. What did I done wrongly? Not smooth surface – did you cover the lid with towel? The condensation might drop on the steamed cake, so make sure to wrap the lid. Chocolate chips – maybe it’s bigger (heavier) than mine? Did you waited for a long time before you start steaming? thank u for this recipe I made this today and they came out super soft and fluffy I’ve never steamed cupcakes or made homemade cupcakes and they came out great. I made the chocolate ones. Made these steamed cake tonight and they turn out beautifully! Thanks again! Not enough sugar, but otherwise a really great recipe! Hi JC! Ah I see. Maybe I should mention that Japanese steamed cakes are not sweet like cupcakes or muffins. Just a subtle sweetness. Thanks so much for trying this recipe! Have you tried steaming these guys traditionally? As in, on a wire rack above the water instead of with the ramekins in the water? I’d like to try these but have left all my ramekins behind, and was thinking they could just be steamed suspended above the water. But it might affect cooking time? Hi Ming! You’re right. You can steam these but it will take more time for some reason. Maybe more gentle than my approach. Great assortment of plain, sweet and savoury steamed buns. My kids miss Japan so much. This would be a wonderful treat for them! How much vanilla would you add for the basic sweet recipe? I will definitely be making these soon! For a family member who is on a gluten-free diet, are there any options for replacing the wheat flour? Thank you! Can you use a bamboo steamer for the mushi-pan instead of a frying pan? May I know if I can steam them in a muffin tray? if yes, do I use a 6-hole or 12-hole muffin tray? is the timing the same as indicated in the recipe? Thanks! Hello Nami! I can’t wait to try these. Can I add macha powder to the basic steam cake recipe (if so how much) ? I do notice u have a green tea steam cake recipe, but my family don’t eat yogurt (on its own) and its hard to find a small container of yogurt where I live. I just don’t want the rest of yogurt to go to waste. These look yummy. If you wanted to add vanilla how much should we add. I just made these and they were absolutely delicious! Thanks for the recipe! Thank you for the recipe! I have two questions. Can you suggest a substitute for egg? My son is allergic to egg. Secondly, have you tried steaming in the instant pot? If so how many minutes and NPR would you suggest. Thanks so much. Love your recipes! After being a silent reader of your blog for years, I’ve now decided to comment after trying the mushi pan recipe. Was incredibly simple and delicious! Will be a regular recipe for a quick snack now in the household. Thank you so much for sharing and keep up the beautiful work! I made the double chocolate Mushi Pan and my whole family loved it! Tomorrow I’ll be making the cheese version. Thanks Nami for another great recipe. 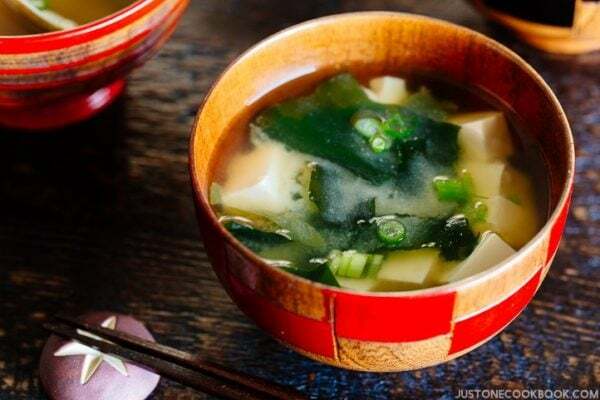 Hi Nami, I love your mushipan recipe, in fact I’ve made the green tea one with my daughter, she loves it. I’m so so new in baking, don’t have any oven or a lot of baking stuff. So your steam recipe is wonderful, even I can make it haha.. I wonder why you use ramekin instead of non stick muffin/cupcake pan?will it give different result? have you tried make mushipan using muffin pan? And the cupcake liner..what is the diameter of it? Sorry if my questions is silly. Hi Lydia! Haha I’m so happy to hear that you enjoy these steamed cake recipe! Yeah, no oven necessary! About the ramekins, first, I have those glass ramekins to make Japanese (steamed) purin (pudding). And I like paper cupcake liners since I can pack them in kids’ snack box and easy for them to peel and eat etc. Hi again Nami, a few weeks ago I made another batch of mushipan using your recipe (2nd time), Compared to your pictures, I came to realize that my mushipan is a bit dense, although my daughter love them still, but I wonder why? how to make them more fluffy? 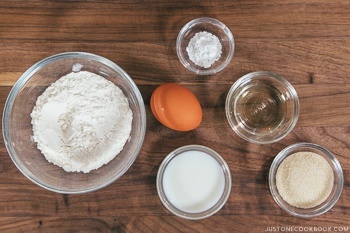 Should I whisk egg white separately and fold them to the batter? Other question, if I want to make 6 mushipan, it means 1.5 recipe, can I use 2 eggs? Will the extra egg give any significant end result? It would be troublesome to use half egg, right? Hi Lydia! I think, from your description, it sounds like you mixed too much. When you over-mix, it won’t become fluffy and end up with dense texture. You could do egg white and egg yolk separately but it’ll be a new recipe. 🙂 . I’d increase to 2 eggs and make bigger steamed cakes (and steam for a little longer). Yeah I don’t like 1.5 recipe too. 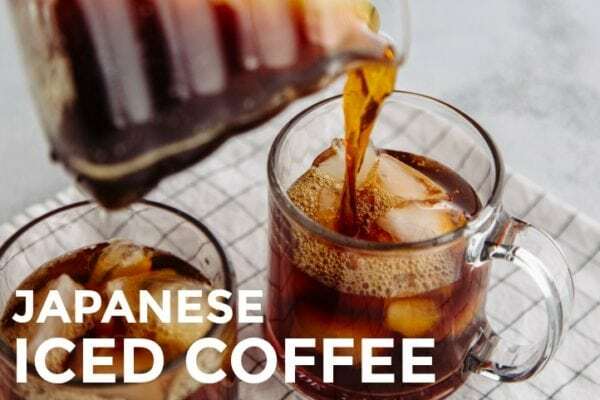 I’ve only just discovered your blog, but as I plan to take a trip to Japan this year, I can’t wait to try some of these delicious recipes beforehand, and also get an insight into some local food. Thanks! Hi, I followed ur recipe but how come my steam cake is porous after removing it from the pan? Hi Hailey! That’s interesting. You mean on the surface/top right? Did you put the cloth on the lid, making sure the condensation won’t drop onto the steamed cake? Maybe whisk too much that air is incorporated into batter and came up to surface? I wish I know… I had never had that issue (or heard from readers who made this and left comment here). Hard to know what went wrong without seeing how it’s made. 🙁 Sorry…. Do you have any suggestions on how to make this if I don’t have ramekins? Would it work in a loaf pan? 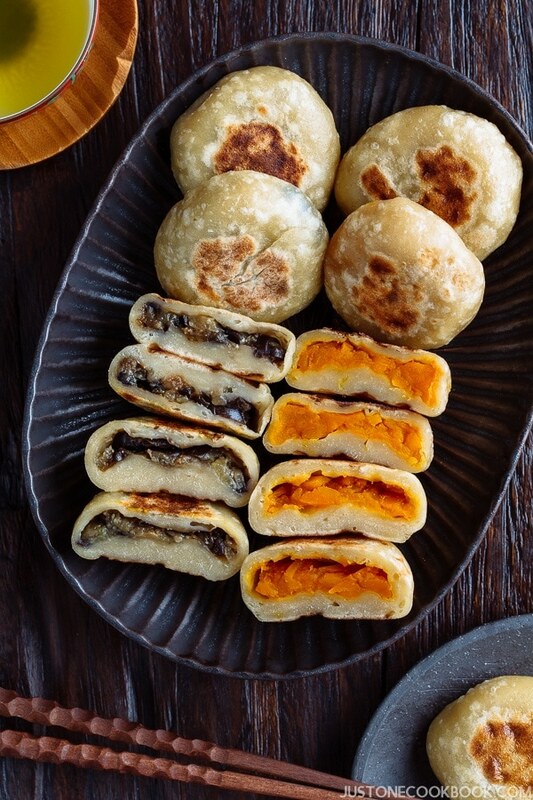 I love mushi-pan and need to make this! Hi… my kids love the sweet potato steamed cake that I sometimes purchased from Japanese bakery. Is it the same as the basic one, just add cubes of sweet potatoes? Or the formula will be different? Thank you for your time. Hi Shihpei! I’d suggest to use cubes of Japanese sweet potatoes (Satumaimo) in basic steamed cake, and see how it is. If you need more sweet potato flavor, you can steam small amount of sweet potatoes (microwave or boil) and mash it and add to the batter. If you use other varieties of sweet potatoes that are not as sweet as Japanese kind, then you can adjust the amount of sugar. 🙂 Hope that helps! The choc steam cakes were delicious! N so easy my 5 yr old made it herself ???? will try adding banana next! Nami, someone just shared this recipe with me, she thought I could do it together with my toddler grandson. I decided to experiment and instead of doing either one, I cut up an apple and added 1/4 c. Finely chopped apple and steamed it for the required 10 minutes. My frying pan with a cover was too small, I don’t have one that’s big enough to hold four! I also didn’t have ramekins, and a trip to TJ Maxx and Ross’ brought me home with Anchor Hockings 1 c. Glass containers with lids, which came in sets of 4! Perfect fit for the cupcake liners, hooray! My question is, can I steam the mushi-pan in my steamer? Btw, the Apple idea turned out really well, next time I think I’ll add a touch of cinnamon! Thank you for sharing such a great recipe! What is the shelf life of this break? Well demonstrated recipe! The steam cakes are easy to make and it is healthy. Even though at first I was not sure about steaming, The cakes turned out great. It is delicious and fun to make. Could this be cooked in the IP..? Thank you! Considering the short cooking time it’s probably not worth using the IP (I only recently got it, so I’m trying to use it more 😉 ), but I’ll let you know if I do it and how it turns out. Congrats on your new IP! I have a new IP recipe that I want to publish…. but haven’t had a chance to write . yet. 🙂 Hope you enjoy cooking with it! I wanted to let you know I made the cakes last evening with my daughter. Easy to make and delicious! We loved them 🙂 I used the regular steaming method and it was quick and easy. I also made the IP pork belly recipe from you for dinner, so you were definitely in our thoughts! Thank you for all these great recipes. I look forward to new IP ones! Hi, may i ask what kind of vegetable oik do we use? Can we use those kind for cooking? Thanks! This was easy to make and super tasty!! Hi Nadine! Thank you for trying this recipe and so glad you enjoyed it! I truly appreciate your kind feedback. Thank you! I had never heard of a Japanese steamed cake before now. I am a cake decorator and curious how would this steam cake would hold up to being cut to Petite Four style and dipped in warm fondant? I will be making an origami themed cake this week, and thought having parts of it in a Japanese cake version would be a nice subtle compliment. I am sooo glad I found your site. I just made basic steam cake with a dash of vanilla, and voila I love it. Your steam cake is not too sweet. It has a little bit of sweet flavor which I like it. For some reason, the double chocolate cupcakes were dry; however, still very flavorful. The basic ones were moister. Love these! Hi Verna! Hmm maybe it has more dry ingredients (less moist) or over-mixed. Thank you so much for your feedback! Hi, thanks for the recipe. I would like to try. How many days will the steamed cake last before it expires? I made matcha, cheese and rum raisins. ???? Hi Jen! I’m happy to hear you enjoyed this recipe. Thank you for your kind words! can I use small aluminum molder instead of glass ramekin? Hi May! I think you can – with cupcake liners? They should help to unmold once you finished cooking. My in laws love it. I made it with Milo powder and Meiji chocolate. I didn’t cover the lid with a kitchen towel cause my lid was in a dome shape. It worked out well. I’ll be trying it with cheddar cheese next time. Thank you for such an easy and quick recipe . hi, which kind of milk do u use in the recipe? Hi Sandra! I use whole for the best result, but you can change if you like. Hi Nami thanks for the recipe! My kids love it. Just a qn..it came out a little harder than those storebought. Is it too much baking powder or I cooked it too long? Thanks. Hi Ivy! Thank you for trying this recipe! Not sure which steamed cake you bought, but the ingredients are different, too. My first thought was steamed longer, but I’m not 100% sure. Maybe you were expecting this to be super soft while this one is not? hi~ I want to make a first birthday cake with this recipe…. would it work in a cake pan? Thanks! Can mushi pan be baked? Unfortunately, it’s not meant for baking. I haven’t baked the batter so I actually don’t know how it will turn out… if you try it, let me know! can i use a steamer instead? if i can, how many minutes will it take? May I know how much more time if we use a steamer? Hi there, I followed your quantity for the milk but discovered there simply wasn’t enough liquid. I topped up almost another 1/2cup of milk. Just wondering if it really is 2tbsp milk for 1/2cup flour? Your photo seems to make the milk look a lot more than just 2 tablespoons. Hi Sue! The recipe is correct. I think your way of measuring flour may be not the right way if you think you need more liquid. I’ve shared the video on how to measure flour correctly here and I hope you take a look. Hope this helps! Thank you so much for sharing!!! Yeah weighing the flour would be the most accurate then yea? I’ll attempt again, would so love to make it work for me! Hi! Im looking for food to feed my baby! This steamed cupcakes look good however she is allergic to eggs. Any idea what’s a good replacement here? Hi, I tried the recipe today and it was really easy and fast. I love it but it was not as soft and spongy as I expected. If I want to make sweet potato flavour, how much sweet potato do I need to put in? Hi Hong Lin Ong! Thank you so much for trying this recipe! In Japan, when we make sweet potato one, we cut the sweet potato into small cubes and add to the batter. Don’t put too much though. Just a small handful to start. Does the sweet potato need to be cooked first or we can put in raw cubes? Hi! May I know if I can steam these in muffin tray with cupcake liners? If yes, how much to fill each cupcake liner and the steaming time is still the same? Thanks! Hi! I steamed them in a muffin tray with cupcake liner. They are so soft after steamed but they turned really hard like kueh after taken out of the steamer and left outside for a while. Will you know what did I do wrong? Thanks! Hi Teo! Thanks for giving it a try (and I apologize for my late response to your original question). I feel like it’s over-cooked or moisture is evaporated. You know when you microwave steamed buns, and take out and wait for a few minutes, it gets really hard? But if you steam properly, it stays soft? I think it’s the same thing. When it’s steamed properly it stays soft but when you give intense heat, it just hard to undo. I do not like to recommend using the muffin tray and steam method, but I had never tried it so I might be wrong, it might be the matter of steaming time. Thank you so much for this recipe! I made the Double Chocolate and Corn and Cheese Mushi Pan this evening and they were so light and springy and perfectly cooked the whole way through. What a great recipe. I live full time in an RV with my family and we only have a gas hob and grill, so I have been looking for a way to make cake without an oven. This is perfect for us and so quick and easy. I will try your Mushi Pudding recipe at some point too, especially now that I have some ramekins. Merry Xmas and greetings from Bundaberg, Australia! Hi Ana! I’m so happy to hear you enjoyed this recipe, and thanks very much for your kind feedback! Thank you for the recipe. I was looking for alternatives as my oven is out of order. However I could never imagine the cakes would be so beautiful, fluffy and great. All the best! I was wondering if instead of a frying pan is it the same method using a bamboo steamer? I’ve tried your recipe today and 3 variations. We did the plain one, whivh we tried first and it was very tadty. As my partner doesn’t like corn I left the corn out and used a bit more cheese instead. Very different, because it is so sweet and yet so savory. We loved it! For the chocolate one: I didn’t have chocolate chips but placed a mini white chocolate ball (Christmas sweets leftovers are great 😀 ) in the middle of each cake before baking. It looked amazing, after steaming and breaking the cake apart, as the white ball melted. All of them were sooo tasty. Surprisingly, neither of us usually like chocolate cake very much but your chocolate steamed mushi pan was our favourite. I’ll try other variations soon, as they are so easy to do. I noticed they need a bit longer (10 – 12 min) in our pan / hob depending on the ingredients. Thank yoy very much for sharing this amazing recipe. Hi Nicole! Thank you so much for your update and feedback! I enjoyed reading your versions and I’m sure other JOC readers will think they are helpful! Hola, se puede hacer en vaporera sin el uso del ramekinsde vidrio? I tried to make these but failed – they turned out hard to touch and firm 🙁 not sure where I have gone wrong, could you advise? Hi Vivien! Thank you for trying this recipe. I’m sorry it didn’t come out well. First, I need to know if there is any adjustment or substitute you made for the recipe. It’s a pretty simple recipe so it should be easy to figure out what can be the cause. Did you cover the lid with the towel? What type of ramekin did you use? I need more information so I could guess. Hard texture could be due to overcooking or water may drop, or ingredients are not right. Hope I can help! I didn’t replace any of the ingredients you stated! The only thing probably was I used an actual teaspoon / tablespoon (instead of a measuring spoon) to measure the amount of oil and milk. I also used a towel to cover the lid when steaming. I noticed however, that when adding the dry and wet mixture together, the mixture looks a bit dry and thick? Is this supposed to be the case? I also used silicon cup cakes mould for steaming. I want to try steam cake as I am not good at baking. Just a few doubts. Can I directly put the batter to ramekins and steam? Also can I steam it in a bowl to make a big one? If yes, how would the measures be for the ingredients? Thanks in advance.